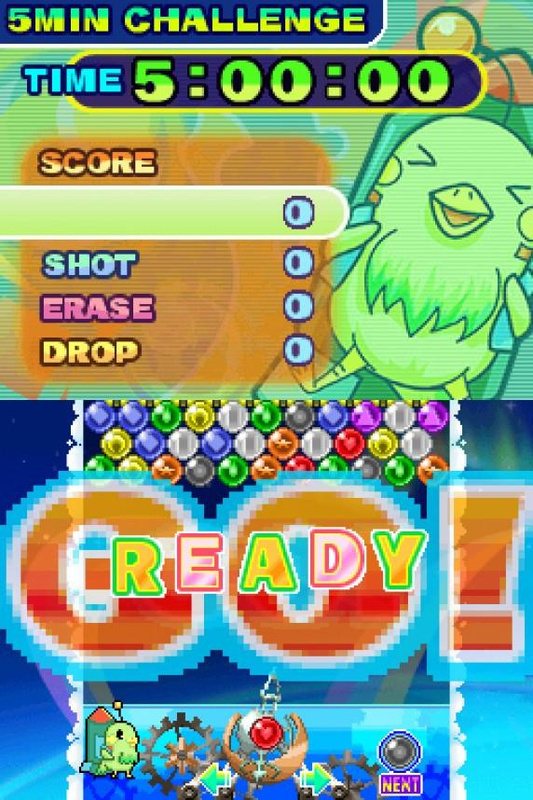 Known by the less-than-cool moniker of "Bust-a-Move" in North America, Puzzle Bobble has been a fixture of the puzzle genre for over a decade, appearing on every console and handheld since the NEO GEO and Gameboy Colour. Puzzle Bobble Galaxy isn't the first Puzzle Bobble game on the DS, but it is far and away the best and potentially the definitive Puzzle Bobble experience on any platform. Featuring a story mode and another half-dozen modes besides, not to mention four-way local multiplayer via download play and even Wi-Fi Connection support for playing friends wherever they may be, this is one bubble-blasting bonanza. The main solo experience is Story Mode, which tells a new tale of the little dinosaurs Bub and Bob who are minding their own business when they hear an appeal from the "space fairy" Snown who has been captured by the wicked bat-winged dino, Develin - a character from Puzzle Bobble 4. 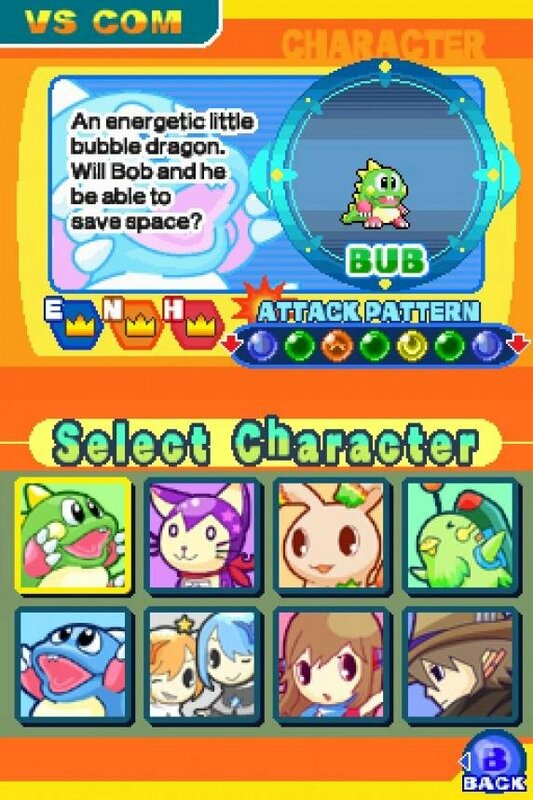 Bub and Bob decide to rescue her; in order to do so they must travel to eight different worlds and collect Cosmo Bubbles, clearing bubble boards and battling bosses before the final showdown with Develin himself! Each world is divided into three stages of five "boards" each and a boss stage. Each regular stage will have a Cosmo Bubble to free in one of the five boards. Cosmo bubbles are coloured bubbles featuring special icons, but they can be burst just like other bubbles, so the key to freeing them is to burst the surrounding bubbles instead. We cannot recall bosses appearing in any other version of Puzzle Bobble, so their presence here is a bit of a novelty. The name of the game is still bursting bubbles, but the bosses make things a little more challenging by having them in various hard-to-reach places which requires a bit more finesse than in a regular board and makes for a nice change of pace. At the completion of each stage you'll get a small cash reward, with a bigger payoff for beating the boss. This currency is used to purchase the many unlockables available in the Shop including three bonus game modes, numerous bubble "skins" as well as alternate launchers. Every time a Cosmo Bubble is earned it unlocks another bubble type for purchase in the shop; otherwise they aren't essential to completing the game. Activating alternate bubble types changes the look of the bubbles used in the various game modes and includes the classic enemies from Bubble Bobble as well as numbers, planets, fruit, sweets or even the faces of characters in the game; whilst the launchers are those used by the different characters featured in the Versus Mode of play. If you manage to complete the game you'll have the end credit film and Jukebox unlocked for purchase so you can listen to the game tunes, which are nice and happy in keeping with the series. It will take many sessions with the various game modes to be able to purchase everything and provides an extra incentive to keep playing. The core gameplay is the same regardless of game mode: launch coloured bubbles from the bottom of the screen in order to clear all the bubbles off the board via a standard "match-three" mechanic. If you've played any of the arcade games or their home console versions you'll know what to expect. There's a choice of control via D-Pad and buttons or using the touchscreen, though the latter is a bit clunky since you tap left and right arrows to change the angle of your shot rather than providing true analogue input which would have been preferred. There's also a "one-handed" option which maps shooting to the L and R triggers for added convenience. The game board is split across the two screens for a bigger playfield, though sometimes getting the angles right when banking shots off the walls can be a little tricky if you're trying to hit bubbles in the top half. Other than the D-Pad being a bit twitchy (the touchscreen interface does provide a little more precision in this regard) we couldn't fault the control. There's a decent level of challenge on offer through the different worlds, but it's not impossible - though world 8 does present some of the toughest puzzles we've seen in the series and it required multiple attempts to beat them all. The extra game modes are plentiful and consist of an Endless Mode and Versus Mode (playing against various AI-controlled characters) as well as two Challenge Modes (get the highest score possible in a fixed time limit: three or five minutes) which are immediately available for play. 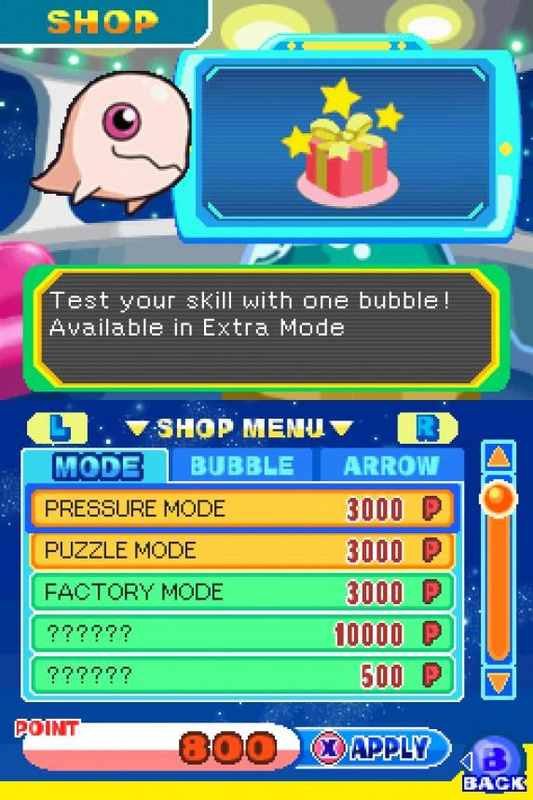 The modes you unlock for purchase are found in the "Extra" submenu and include Puzzle Mode (a series of regular Puzzle Bobble stages), Pressure Mode (each board needs to be cleared by shooting a single bubble "just right") and Factory Mode (clear each board given a set number of bubbles). All provide some nice variations on the central bubble bursting premise for when you need a change of pace from the regular game. Versus and Multiplayer games are played with the player in the bottom screen and opponents appearing in the top screen (in a four player game their boards are rather small, but with sufficient detail to make out what's happening). In addition to the bomb, rainbow, star and metal bubbles found in previous games in the series, you'll find some special bubbles to change things up in Versus and Multiplayer modes, amongst them attack bubbles that make your opponent's launcher invisible and support bubbles that remove the bottom five rows in your board. As with other DS games the only encryption support is WEP, but provided you're willing to make the security sacrifice you can swap friend codes and engage in online matches (or less-likely hook up with someone randomly) via Wi-Fi Connection. 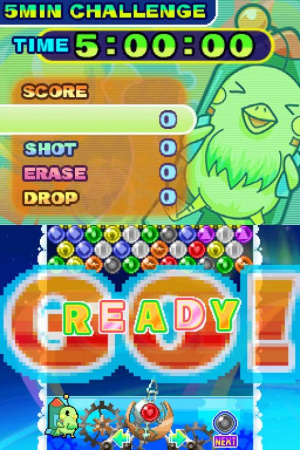 Puzzle Bobble Galaxy really pulls out the stops to deliver a must-have Puzzle Bobble experience. It still commands a decent price, but it's definitely worth picking up regardless of cost, whether you're a fan of the series or just like a good bit of puzzling on your DS. I never even knew this existed. I'll have to go pick it up sometime. Great, I love Puzzle Bobble! It's one of my favourite series, especially playing competitively against friends. I must pick this up. I got this on release day last August. Cracking game for p.bobble traditionalists, newcomers, casuals, in-betweeners and those who want a meaty game challenge. One of the best puizzle games on the ds, and that's saying something. I'm glad Sean reviewed this as he has an in-depth appreciation of puzzle games. Called Space Bust a Move in NA? Worth it even if you do have the slightly inferior wiiware game. I wonder why they got rid of the slingshot mode from Bust-A-Move DS. It worked so well for me. Probably to give people a justification to have both? There's a reason this one is harder to come by, though. I did my research before picking it up and counted myself lucky to only pay £13 on Ebay. 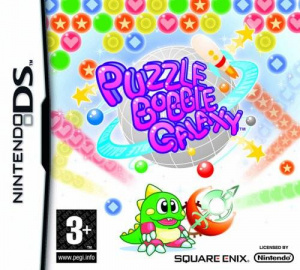 I like the name Puzzle bobble galaxy way better. [reminds me of Mario Galaxy], but I'll look into it nonetheless. I love me some Puzzle Bobble. Might have to look out for this one. I totally agree with this review. Puzzle Bobble is the only puzzle game I'm actually good at.